Explanation for the labs – Now most of the labs include explanation for the lab. New commands and functionalities have been explained in detail for ease of understanding. Update to command sequence- Based on the user feedback, we observed that a few conditionalities are in conflict with execution of certain commands. The same have been fixed. New labs – a few labs have been added. Improved lab diagrams – Again, based on user feedback, some of the lab diagrams have been redone to provide clarity and readability. Show commands – Several “show” command outputs have been added in the new version. It helps in understanding how to determine the configuration of the device after a particular set of configuration tasks have been followed. Being a virtual device, the commands that are available for simulation is limited to the scope of CCNA/JNCIA. However, new commands and functionalities are added often as required to provide better user experience. Other software available include Network Simulator for CCNA (CCNA Netsim), Juniper Network Simulator for JNCIA, Comptia A+ Labsim and Network+ labsim. Please check out the website for more details. Anand software and training releases update on CCNA NETSIM. Network Simulators Comments Off on Anand software and training releases update on CCNA NETSIM. Ability to bookmark the labs so that a user would be able to return to the lab at a later time easily. Ability to mark the labs as 1) in progress, 2) yet to be completed, and 3)Completed. A user would be able to readily identity the lab status by looking at the colour coding. In addition, a progress score has been implemented that indicates the extent of lab that has been completed. It is possible to save the configuration and return at a later time to complete the rest of the lab. Progress bar: A progress bar indicates the extent of lab that has been completed, and what’s remaining. It indicates when the lab is successfully completed. Disclamer: CertExams.com is not associated with Juniper Systems. Juniper, JUNOS are the trademarks of Juniper Systems and duly acknowledged. A GUI quickens the learning curve required by a network administrator by providing easy to configure graphical options (such as drop-down menu, etc), and one need not remember the conventional CLI commands. The GUI closely mimics the Cisco Configuration Professional (CCP) providing a simulated environment. It also enables a user to get hands-on experience in using Cisco’s most recent CCP graphical interface. 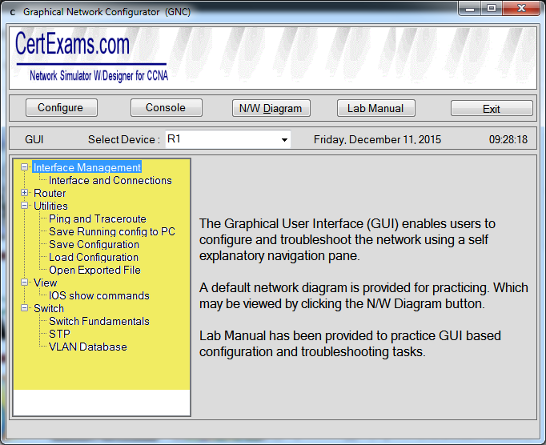 Download CCNA NetSim. Try the software free. Upcoming: We are now working on code signing our software products to ensure that the software is delivered to the user without being tampered, thus providing 100% virus free, and fully trusted software products. Network Simulators Comments Off on Juniper Junos NetSim Revised! Support for Juniper Swiches – For the first time, Juniper switches have been added to the netsim. Now on, users will be able to configure routers as well as switches using the software. It is now possible to design a Juniper network using routers as well as switches. Lab Exercises – Several Lab Exercises have been added to include Juniper switches and routers. This provides good hands-on practice for beginners. New Commands – New commands included for switches and routers. Switch commands for VLANs, VTPs, and others added.